Maggie wanders into Angelique’s room to hear Angelique's voice taunting her, comparing them as common versus glamorous. Liz talks her down from jumping by insisting that jumping would ruin Quentin. In interviewing Hoffman, Barnabas asks why Angelique owned books on witchcraft and promised to return from the grave. Hoffman brushes them off as metaphors. In Angelique’s room, Barnabas stares into the eyes of the Angelique portrait, demanding the truth. Across the estate, Angelique (as Alexis) senses being observed. Her eyes are burning! Barnabas commands her to come closer and closer until she runs into the room, screaming. She knows. And he knows. And she knows that he knows. And he knows that she knows that he knows. 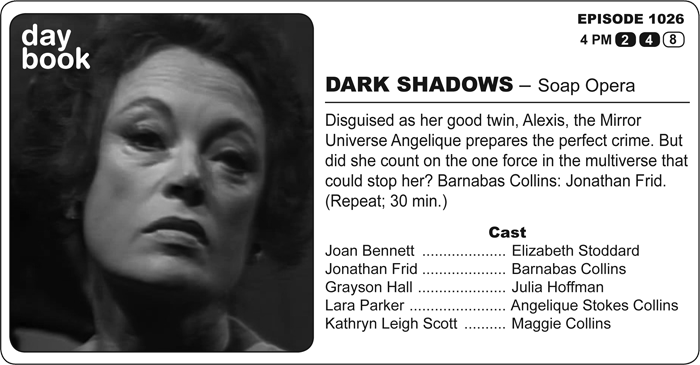 Today is the birthday of the memorably menacing Erica Fitz, who played Leona Eltrich and Danielle Roget. She put in a wicked, strong performance as the evil spirit of Eve. Her career wasn’t terribly long, but it wasn’t dull. Not only did she welcome Arnold Schwarzenegger to the USA by co-starring with him in HERCULES IN NEW YORK, but she also sexed up the Broadway farce, THERE’S A GIRL IN MY SOUP, co-starting the Third Doctor, himself, Jon Pertwee! Stuck on Earth in that incarnation, his Doctor used his wisdom to guide a world-protecting service and protect the planet. Hard to find, look up the episode “The Daemons” for DR. WHO at his very best.